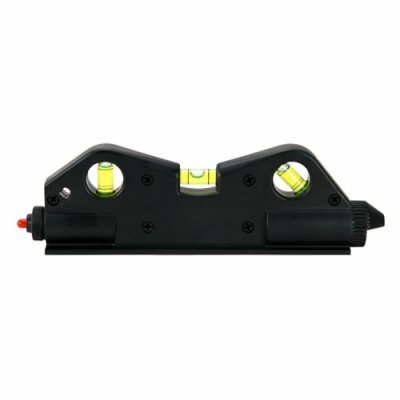 Successfully Added Laser Plumb Alignment Tool with Magnetic Base + Mini Tripod to your Shopping Cart. This laser guided measuring alignment and leveling tool will fill every DIY enthusiast with excitement. Now you can enjoy working on all your home do-it-yourself and construction trade jobs with an ultra portable tool that gives professional laser accuracy. Traditional plumbs are rapidly becoming a thing of the past. With today’s DIY projects, be they at home or in the field, a more professional approach is needed in measuring and aligning if you don't want to waste your precious time or money on expensive materials. With the CVMH-G166 you can align up to 100 meters in distance using this new laser plumb - this is something a traditional plumb simply cannot do! This mini laser edge leveler is the perfect tool box accessory, and it's even designed to fit in your pocket. This new red laser level tool projects a perfectly straight laser and comes with three built in level bubbles to help make your home DIY projects the best they can be. The triple-bubble edge guided leveler is used to install shelves, hang picture frames, align windows or doors, straighten painting works or tapestry, joinery works, wood working pipes, wires, cabinets, tiles, false ceilings and much more. How does it work? This portable laser edge plumb indicates leveled lines against any surfaces to install home decorations. This is a professional leveling tool with horizontal, vertical and 45 degree liquid levels. And that’s not all. The bottom of this laser plumb is flat and magnetic, that can be used to mount on to pipes, metal studs, and drop ceiling framework. This fantastic DIY Laser guided plumb is in stock now, and certainly makes the perfect Christmas gift for fathers, uncles and anyone that enjoy DIY projects. Get yours today from the leaders in factory direct wholesale electronics, Chinavasion. Which degrees can I measure with this gadget? You can measure horizontal, vertical and 45 degree angles with this red laser plumb. Does this product have a belt notch? This laser level has a lanyard type loop hole at one end so you can hang it off your tool belt, key clip, or whatever else you like. Why does this product need batteries? To power the red laser. The leveling bubbles need no power.